Detachment means that you stop taking responsibility for things that are outside of your control. Maybe you're dealing with a family member who makes bad choices or an alcoholic partner. By stepping into someone else’s drama we unknowingly create more stress. In this blog, you’ll learn how to avoid getting lost in a loved one’s chaos. Detachment isn't abandoning someone or being indifferent to their pain. It's not leaving the relationship or giving them the cold shoulder. Detachment doesn't mean that you stop caring. It means that you lovingly let go of solving their problems. You stop participating in their chaos. Trying to fix it doesn’t always help the situation. Instead, find ways to lovingly separate yourself from their choices. Stop spending your mental energy focusing on the crisis. When you find yourself getting lost in the drama, it’s time to practice some detachment. There is a popular saying in 12 step recovery called "detach with love" which means that you accept reality without trying to manage it. Let whatever happens just happen because you can't prevent it anyway - and you'll probably lose your cookies if you keep trying! Whether you’re trying to rescue someone, give more than you should, or neglect your commitments to help others, detachment allows you to take care of yourself first. 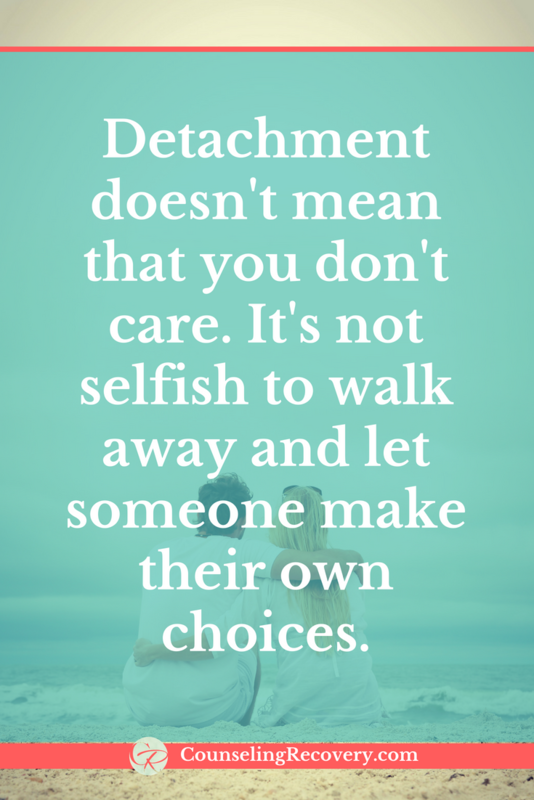 It's not selfish to detach, it's self-care! When the people you love are struggling, it’s hard to watch. This is especially true with addiction or bad behavior. You want to take away their pain, but you can't. Getting caught up in someone else's pain distracts you from your own. For instance, a friend confides in you that they're binge drinking. You want them to be safe, so you take it upon yourself to find professional help. You spend hours researching treatment options only to realize that they don’t want help after all. You’re totally exhausted and have no energy left for your own problems. If someone else's drinking bothers you, click here to read Are You Codependent? Tip: It’s kinder to support a friend’s struggle without trying to change it. Giving advice makes you feel like you're contributing, but most people aren't looking for that. You don't ask for advice because you’re not seeking a solution as much as support. You want to be heard, not told what to do. Think about it, how many times have you been asked for advice or asked someone else for advice? Even as a therapist, I don't get asked that often because my friends want to be understood, not coached. Tip: It’s okay to give advice but it's better to wait until you're asked. Taking responsibility for another person's problems is a form of control. You think that you’re the only one who can make it better. You start doing things for others that they should be doing for themselves. Assuming that “you know best” the other person has no motivation to take action. They don’t learn how to be on their own. Over time, this creates an unhealthy dependency that hurts, not helps them. Tip: Stepping back from their problems helps you focus on solving your own. Worrying about the future or regretting the past keeps you stuck. Bringing yourself into the present moment is about living your own life - not someone else’s. Part of detachment is trusting that there is a lesson in letting go. Preventing someone else’s consequence doesn’t fix the problem. You don't have to take responsibility for other people’s problems to feel needed or to be happy. In fact, the opposite is true. When you're trying to control an outcome, you're anything but serene. Tip: Practice healthier ways of showing support like validating their feelings or reassuring them that this too shall pass. Trying to solve someone else's problems makes others feel controlled despite your good intentions. Relationships become strained as you end up feeling powerless over the outcome. In 12 step recovery, admitting powerlessness is the first step in healing. It's hard to let go and detach, but doing it with love invites them to find their own solution. I’ve created a private resource library including 20 Ways to Detach When You Need A Break and 15 Steps to Setting Healthy Boundaries plus more! Click the image to get access now!